The lasting economic crises in Brazil, South America’s former powerhouse that resulted in a 4 percent drop in GDP with the consequent impact on cargo volumes lately, has LATAM Cargo forced cutting down its capacity. The carrier’s Head of Sales Álvaro Carril, while speaking at the German Air Cargo Club (ACD) last week, illustrated how grave the situation is and which steps his freight airline is taking to best weather the storm. Alvaro is no man shying away from open words, demonstrated once again at the ACD meeting in Frankfurt, Germany. While declining fuel prices are a positive factor for any carrier, helping to save money, their current drop has been counterproductive in the case of Latin American freight traffic, he told the surprised audience. This, because “low fuel prices have motivated a number of suppliers to take older aircraft back into service,” Álvaro described. By doing so, they added to the already excessive capacity, sending the yields further south, criticized the manager. “This shortsighted strategy harms all of us,” he exclaimed. LATAM Cargo’s options to seek their fortune elsewhere, circumventing crisis-hit Brazil and other ill performing South American sub-markets, are extremely limited due to their geographical position, operating mainly out of Santiago de Chile and Sao Paulo but also Lima and Bogotá. “We can’t just put our passenger aircraft or some of our freighters on alternative routes outside of our region that are more lucrative, serving other markets,” states Guido Henke, LATA Cargo’s European Chief. In view of these rather limited options to adjust the network to changed economic circumstances, the entire LATAM Group including its freight unit LATAM Cargo have introduced a far-reaching austerity program. Besides job cuts and the strict control of expenditures, it includes the temporary suspension of aircraft receptions. Therefore, a substantial amount of the deliveries of Boeing and Airbus passenger variants scheduled for the period 2016 until 2018 were postponed,” explained Herr Henke. “Due to sluggish demand we don’t need additional capacity at this point of time,” Guido reasoned. In compliance with this decision, transatlantic operations to and from Europe were reduced by two weekly freighter flights, from formerly six services to meanwhile four. Since June 1, the Amsterdam flights to Curitiba and Viracopos, formerly operated by Boeing 777Fs, were taken off the itinerary. 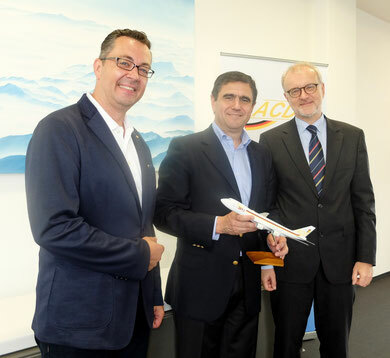 “However, we maintain our three weekly Frankfurt flights to Brazil and the once per week operated Amsterdam-Basel-Sao Paulo connection. That’s the only nonstop all-cargo flight linking Europe with Sao Paulo’s city airport Guarulhos,” states LATAM Cargo’s manager Henke. On the sidelines of the ACD meeting both executives hinted, without delivering specifics that in September LATAM Cargo will launch a new product portfolio and push a campaign dubbed “we deliver consistently what we promise,” putting the service aspect in the forefront of the campaign. “Some of our direct competitors might be cheaper, but when it comes to reliability and service rendered we keep standing in the pole position, knowing well that our customers have the right to choose,” stated Alvaro Carril.